Tour de Cebu is more than just the cars, sceneries and drives. It is also about new friendships and the experiences of the ladies and gentlemen who participate. 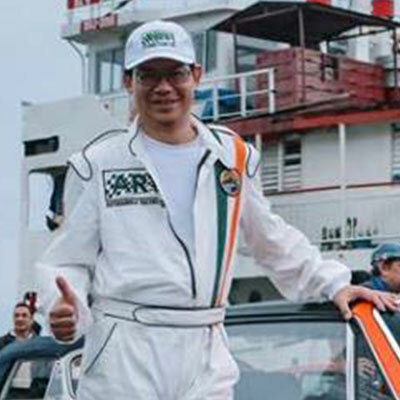 We are fortunate to share the story of Architect Daniel C. Go (fuap, APEC Architect), who along with his wife are first-time participants in our historic car rally. We now turn the spotlight to our friend Daniel who shares his very own experience at the 5th Tour de Cebu. I have always been fascinated about driving my car on long drives and across unknown but beautiful sceneries. The thought of hearing my car’s engine hum while enjoying the beauty of nature is a dream that I wish I could afford. Unfortunately, my work as an architect and my busy schedule always kept from pursuing this dream. That is until my Tour de Cebu experience in November 2018. I had heard about the Tour de Cebu from my friends in the Manila Sports Car Club Oscar Medalla and Michael Aguilar. I always found their stories about their experience, driving their historic cars for 3 days and 1000 km across the scenic roads of Bohol very interesting and exciting. Stories about the race as well as the pictures they showed me would always arouse my curiosity. Oscar even had his wife Lally as co-driver. This made it even more intriguing for me. I would often find myself daydreaming and secretly wishing that I would have the chance to drive around Cebu and Bohol in my own car with my wife Ellie. However, most of the time, I would talk myself out of joining as the thought of all the work and logistics required to join the tour was daunting and a big hassle. I always reasoned that I am too busy for this. But all of this changed one day in December 2017. Still, I have my reservations so I kept putting off the commitment till 2 months before the tour. The only historic car I had that would qualify for the TDC was a 1968 Mercedes Benz 280 SL which is popularly known as the “Pagoda”. I had this car restored way back in 2009 but has never driven it more than 500kms since. I would take it for short drives to MSCC meetings. It’s literally a garage queen. When I finally committed to join TDC, I made a very exhaustive and detailed effort to make sure that everything will be in perfect condition. Since this will be our first time to join and we don’t know what to expect, I have many apprehensions, 2 of which were: shipping the car to and back from Cebu, and how to make sure that my car will complete the race. Fortunately for all participants, shipping the car to Cebu was a breeze as the organizers made all the preparations and looked after every single detail. It wasn’t a big hassle after all. The main concern was the preparation of the car. Weeks before the tour, I brought the car to the shop and made sure that everything will be checked and all parts will be replaced with new. I want to make sure that I will not encounter any problems during the tour. I also made sure that the car will be in excellent condition aesthetically. I want my entry to be excellent. A few days before the Tour, I heard that some participants are still having something fixed on their cars but mine is already ready and all set to go. I was very confident. When we got to Cebu a day before the race, my wife and I sat down to talk about our expectations for our Tour De Cebu experience, we both agreed that all we want to do is finish the race, enjoy the experience and make this a great bonding time for both of us. But deep down inside, I wanted to win, I guess that’s what every car guy in a race wants to do. During our registration upon arrival at the venue, Sophie Delos Santos introduced me to Chris Tio, the Grand Marshal of TDC. Upon learning that we have many friends and hobbies in common, Chris put me at ease and gave me a lot of advice on what to do and what to expect during the race. During the Drivers Ball dinner at Montebello Villa hotel, we met some friends and made new friends. There is a sense of electrifying excitement all over the place. Every participant was very friendly and accommodating, sharing their past experiences and lessons learned with the previous TDCs. As expected, race day was a very exciting day. From the convoy to the pier, to the loading of our cars to the Roro, seeing all these historic cars gathered together was a sight to behold. My wife and I were very excited. When we landed in Bohol, there was a lot of pomp and we were paraded around the municipal hall. The Mayor and local officials were there to greet us and see us off. As the race is not about finishing ahead of the pack but is a race against time, we were sent off in batches, we were on the fourth group to be flagged off. At first, I tried to keep my speed at 60kph but I often find myself being overtaken by other participants so I decided to speed up a bit to make sure I will be on time. True enough, the roads along Bohol is so nice and scenic, my wife commented that she is so thankful for being here and enjoying the drive and the view. My car was running so well and I was very confident about finishing. But things were about to change and my apprehensions were about to become a reality. About 120-kilometers into the race, I decided to stop at a gas station to fill up. As I stopped and got out of the car, a guy on a motorcycle pointed to my hood and mentioned that there is smoke coming out. I got alarmed and immediately popped my hood open. True enough, there was smoke coming out but it was not from my radiator but from my battery. My battery was boiling hot! I pour water over it to cool it down while my tank was being filled. When I tried to start the car, the engine would crank a bit but would not start. My worst nightmare soon began. I called the Marshals to ask for assistance and in less than 15 mins, there was already a crew of mechanics who got to my spot to assist me. The mechanic mentioned that the IC voltage regulator on my alternator might be broken and had destroyed my battery. He suggested that we go and find another battery so I can still proceed with the race. As Bohol is a provincial area, I was skeptical about finding a battery that will fit my historic car. But my wife and I whispered a prayer and asked for a miracle. After driving around for about 30 mins, we found a store that sells car batteries and was able to find one that is compatible. After going back and installing the new battery, we were again off and running. But by this time, we have already lost about 2 hours of our time was already considered time-bound, incurring maximum penalties. But as we agreed, we just want to finish the race. No need to win. So off we went, going the route and enjoying the scenic view of Bohol. After 2 hours, it was already getting dark but we are still way off the finish line. The Head Marshal, Pepon Marave, called me and asked me for my exact location. I told him that we are still on the route but he told me to take the short cut as there was nobody along the route anymore to assist us and it was getting dark. At first, I stubbornly insisted on completing the route but my wife told me to just follow instructions and go towards the finish line. So, I took their advice and drove along the coast, taking the short cut. The drive along that stretch, like the sunset and the coastline, was awesome. After crossing the bridge that connects the main island to where our hotel and finish line is located, we took another short cut through a dark and deserted back road. We were about 3 kilometers away from the finish line when all of a sudden, my car stopped and died on the road. The engine would not crank. It had simply died. So, I called the marshals again and requested for a tow truck to bring my car to the finish line. While waiting for the tow truck. I apologized to my wife for the troubles that she has to go through with me as the car broke down. I was so frustrated. But she assured me that its fine with her and even gave me a sandwich to eat since we were not able to take lunch when our car first broke down. When we were finally at the hotel and my car was brought down, I was so worried because I know that my alternator was an upgraded unit and there is no way for us to find a replacement in a remote island like Bohol. Chris Tio, who by now had become a very good friend came over to check on me and my car. Seeing how distressed I was and assessing the situation, he mentioned that he knows just the right person to help me out. He called Jerry So, who is a sponsor of the event representing LiquiMoly and who also happens to be an expert in Mercedes Benz, to come over and assist me. After going through many things in my engine and cleaning it thoroughly, he was able to start the engine. Praise God! But he told me that the new battery I had just bought is already destroyed and the voltage regulator was broken, hence why it was overcharging. My heart sank. Where in this remote island will I be able to find much more buy a replacement alternator for my car? If I can’t run the car, how would I finish the race? Even worse, how would I get back to Manila? All my preparations had come to nothing. I didn’t expect the alternator would break down. Suddenly, Jerry mentioned that he might have an alternator similar to what I have but unfortunately it’s in Cebu and he was not sure if it will fit as it’s a different brand. Chris overheard us and mentioned that his wife Julie will be coming over from Cebu to Bohol the next day and offered to bring it here. But then, Jerry said he is not sure if it will fit but it’s worth a try. That night, while everyone was enjoying the Welcome Cocktail reception, I was standing outside worried about how I would be able to bring my car back to Manila. I was not even thinking about finishing the race anymore. When we settled into our hotel room, my wife and I got on our knees and prayed. We know that since God has given us this opportunity to join this race, He definitely has something or a lesson for us to learn through this experience. We just have to learn to trust Him. The next morning, I got up early and joined the drivers briefing even if I knew that I would not be able to drive anymore. As the cars were being flagged off, there was a tinge of sadness in my heart, a sense of defeat as I watched each car drive off. There were so many things going through my mind. I tried to arrange for an alternator to be shipped to me but couldn’t get things done properly. It was extremely frustrating. Finally, I went back to my hotel room and once again prayed and went back to sleep. I woke up around lunchtime and got a call from Chris asking me to join him for lunch. As we sat down, we had a great time of fellowship. He told me about the history of Tour de Cebu. We got to talk about a lot of things. It made me realize that organizing this event takes a lot of passion, sacrifices, and effort, all for the love of driving cars, for camaraderie and friendship. A few hours later, his wife and son came over and joined us. She had brought the alternator but we have to wait for Jerry who is still out helping with the race. At around 3:30pm, Jerry called and mentioned that he can start to work on the car again. By this time, many of the participants were already back from the race and were on hand to assist us. Some of the mechanics of the participants even volunteered their tools, gadgets in an effort to help get my car going. To our amazement, the alternator that Jerry had, was a perfect match to my bracket. Jerry was also able to find and buy a more compatible battery while in the midst of assisting the race. Praise God for answered prayer! There was no need for any alterations or fabrications. We just needed to remove the pulley and install it on the new one. One of the mechanics was able to do so by improvising. Talk about Filipino ingenuity and creativity. After about an hour, our car was running well. Jerry told me to go out and try it for a few minutes. It ran very well and the alternator was stable. That night, during the Fellowship dinner, everyone was so happy for me. But I always tell them that it would not have been possible if not for the help of Chris, Jerry, the mechanics and the moral support of everyone. On the third and final day of the race, we were able to complete both stages without a hitch. The car ran very well and I was even informed that we did very well with race time. As my wife and I crossed the finish line amid the cheer of friends and participants, we cannot help but express our thanks to God for the experience and for the lesson, on how all things came together and work out very well in the end. My experience with Tour de Cebu was awesome. Even if I didn’t win anything and didn’t really complete the race, it was worth the time and effort to join. To be able to spend quality time with my wife while driving my car on wonderful open roads and appreciate the scenic view, to admire the beauty and classic lines of historic cars, to enjoy the camaraderie, to have the opportunity to meet new friends and connect with old ones, to discover the good nature of most participants, to feel the care and concern of the organizers, to be able to see God’s miracle at work in even the most dire situations, is something that I will cherish for the rest of my life. As my wife said when we were on our flight back to Manila, “We will join the Tour de Cebu next year and I will still be your co-driver, we need to come back and complete the race.” Maybe this will be the start of a great annual family event for us. To everyone who reads this article and is contemplating to join the Tour de Cebu, I encourage you to take that leap of faith and do it. You’re in for the drive of your life. Illac Diaz shares a truly memorabile father and son road trip experience at the 5th Tour de Cebu. Tour De Cebu was never expected to become what it is today. Initially, it really was just meant as an activity to celebrate 10 years of existence for our Cebu based car club Performance and Classics Enthusiasts or better known as PACE.